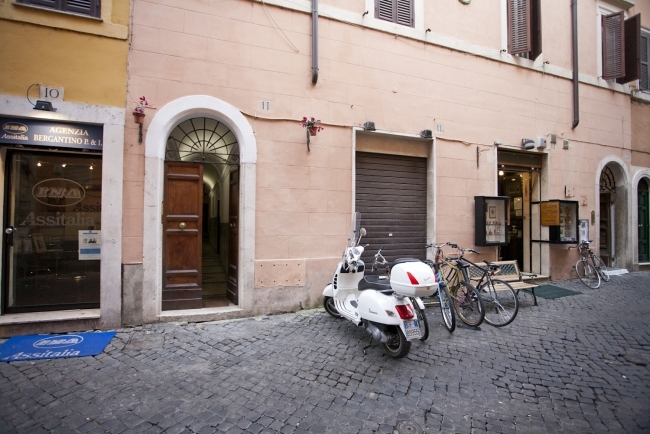 Rome's centro storico (historic district) is full of life and is without a doubt, where the locals do their shopping. 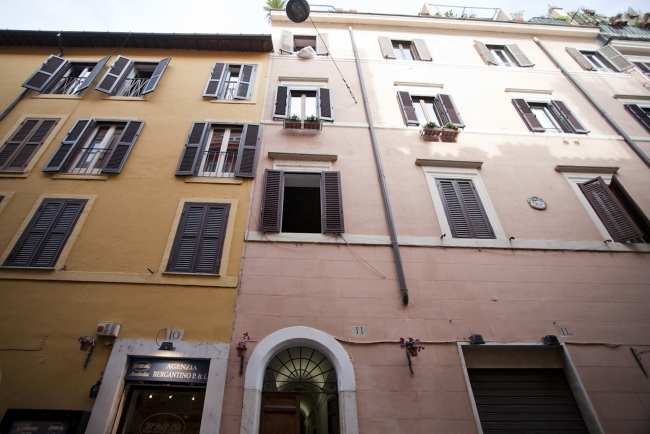 Via del Corso is a long street lined with shops that is closed off to vehicles on weekends. 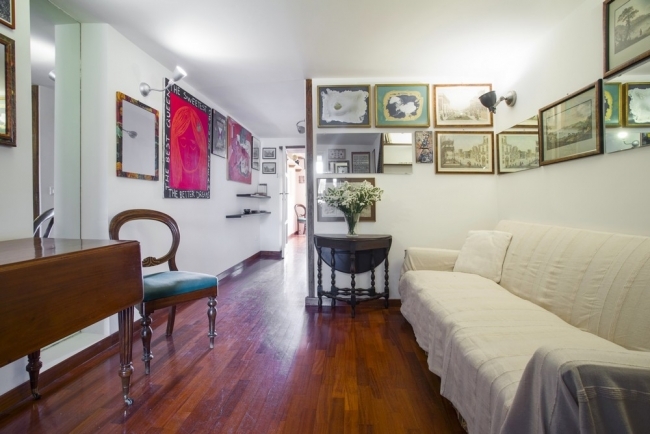 Via del Babuino and Via Margutta run along the foot of the Pincian Hill and have been renowned for their art galleries and studios since the 15th century. 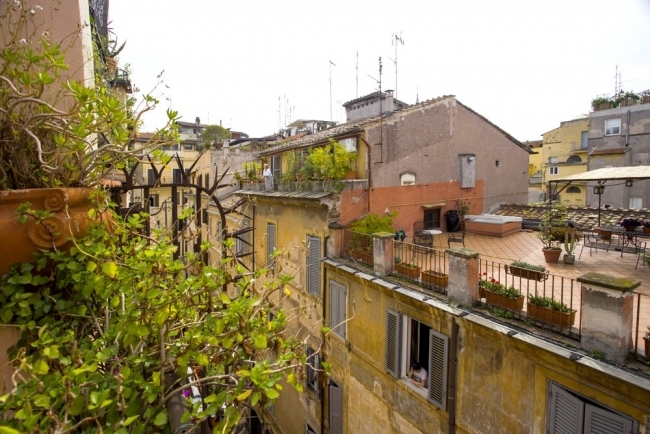 Lastly, Piazza di Spagna and Via Condotti are without a doubt the places to go for all the top names in Italian and international fashion. 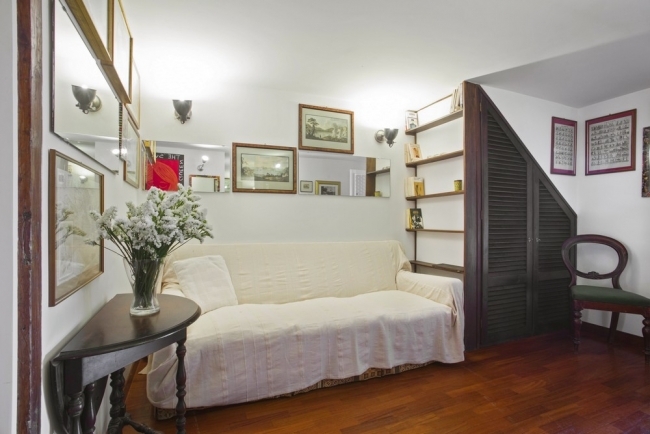 This charming, quiet and spacious fourth-floor duplex apartment (66 m²) is very charming. There is no elevator in the building. 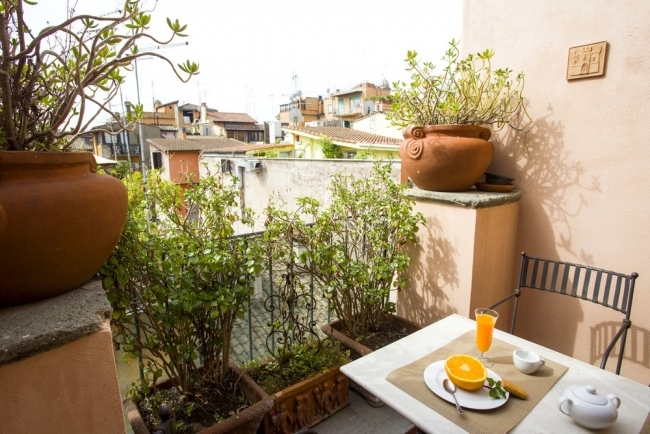 The apartment features 2 nice terraces offering a beautiful view of the city skyline, the Villa Medici, the Trinità dei Monti church, and the Basilica di San Pietro (St. Peter’s Basilica). 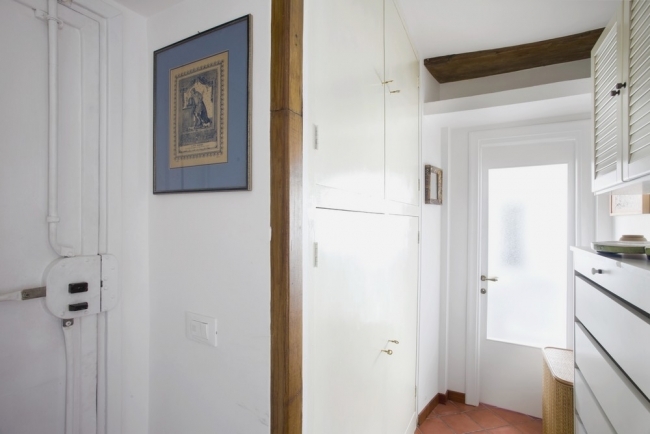 The 2nd level, with sloped ceiling and exposed beams, is very bright and typical of Roman houses. 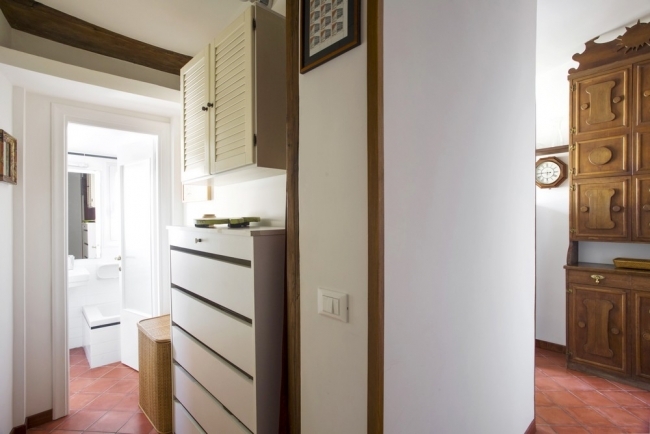 We enter the apartment through a hallway (4,50 m²) where you can find a wide closet. It leads to the kitchen and to the bathroom. 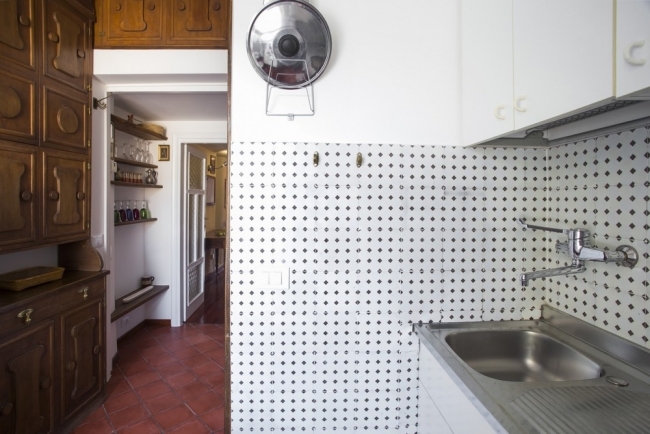 The kitchen (7 m² - North facing) has a big window with a view on the rooftops of the neighborhood. 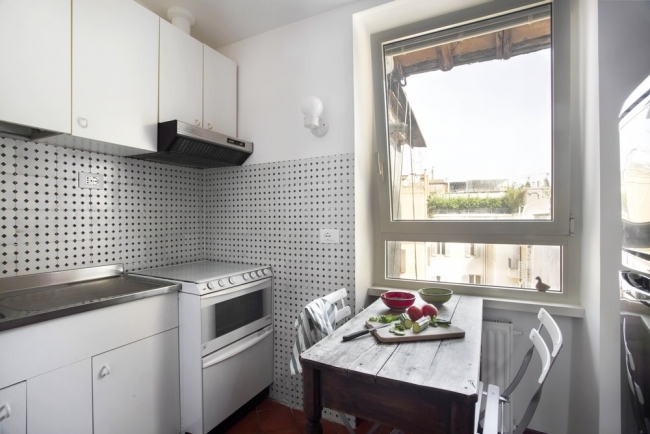 It’s fully equipped with all the modern convenience you may need: sink, gas stove, oven, cooker hood, fridge with a freezer compartment, cookware. It’s also furnished with a buffet, a table and 2 chairs. 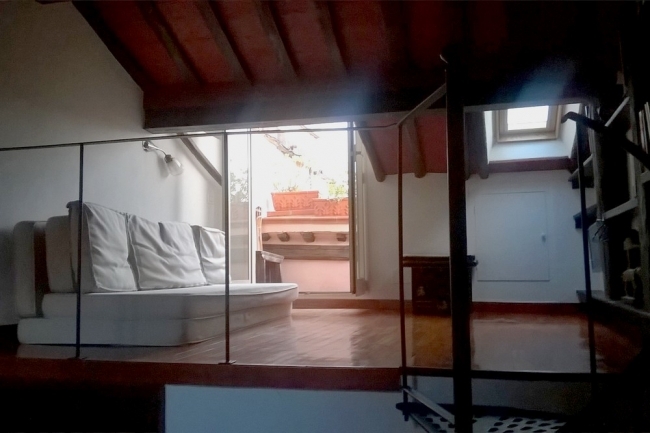 The living-room (15 m² - no window) is separated from the kitchen with a glass door. 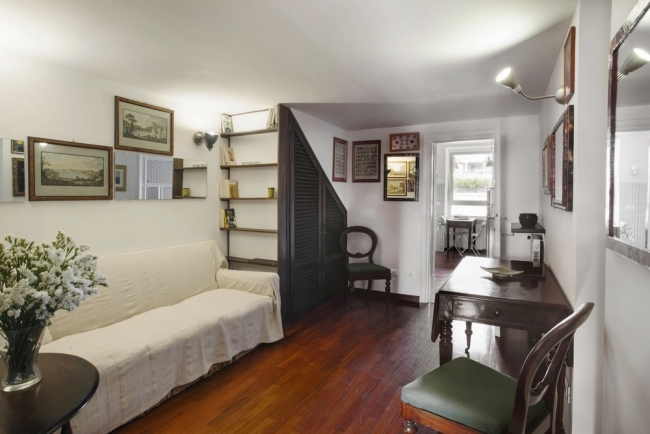 It’s furnished with a sofa, 2 small tables, a big wooden table and 2 chairs. It’s decorated with many paintings and mirrors. It leads to the master bedroom (opposite side of the kitchen) and a wooden staircase leads to the 2nd level (office area and loft bedroom). 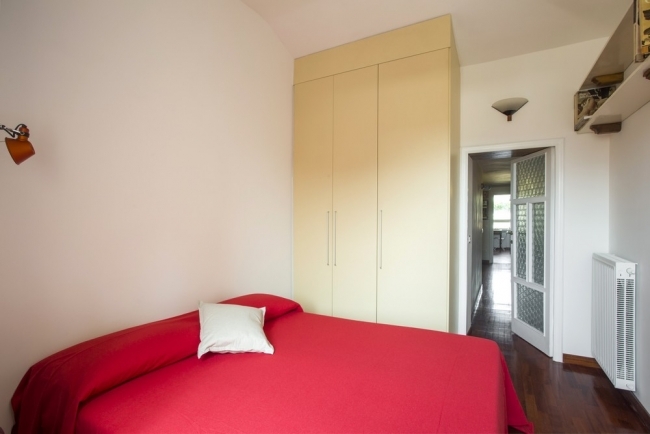 The master bedroom (10 m² - South facing) is composed with a double bed, a chest of drawers, a closet, and has a Hi-Fi. 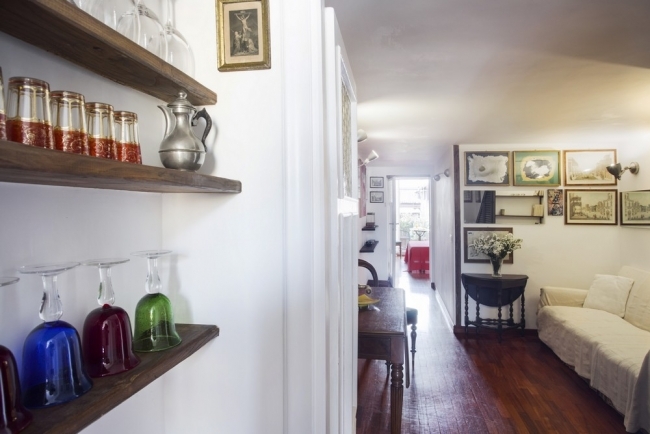 A French door leads to the 1st terrace. 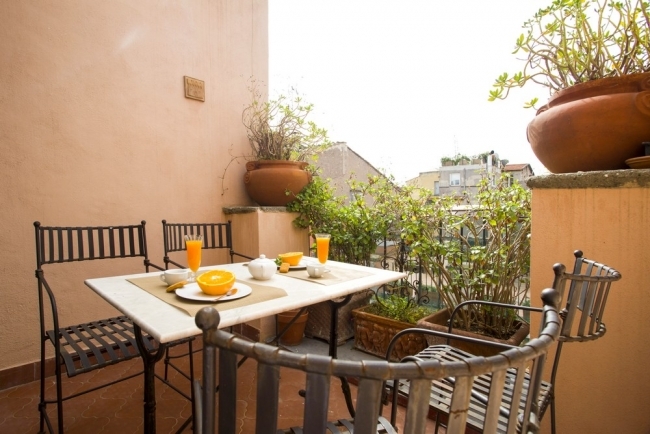 This 1st terrace (4.50 m² - South facing) has a table with 4 chairs. 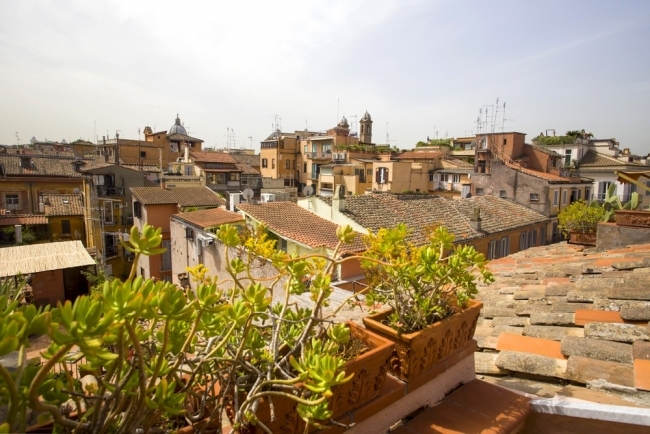 It offers a beautiful view on the rooftops and is facing Via Laurina. 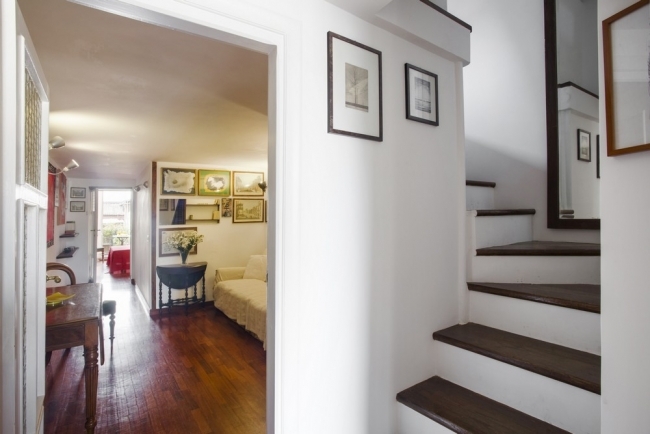 Wooden stairs, very easy to ride, lead to the second floor from the living room. The office area (10 m² - North facing) has sloped ceilings and has 2 windows (including a velux). 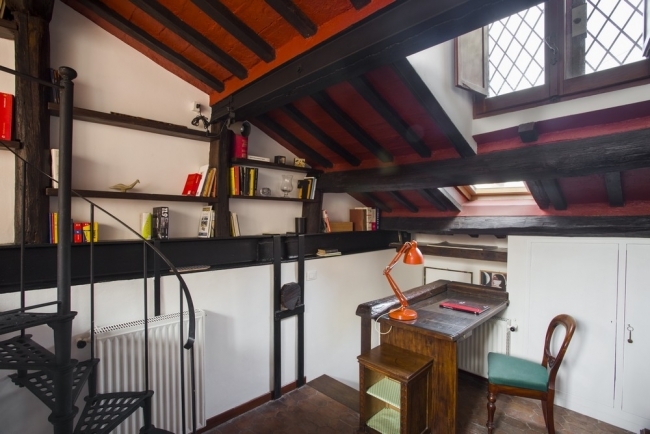 It’s furnished with a wooden desk with a chair, 2 small tables, a wooden library and a wardrobe. 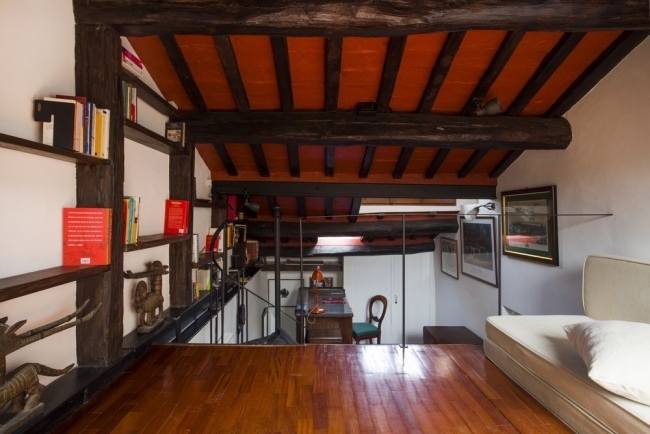 A small spiral staircase leads to the mezzanine. 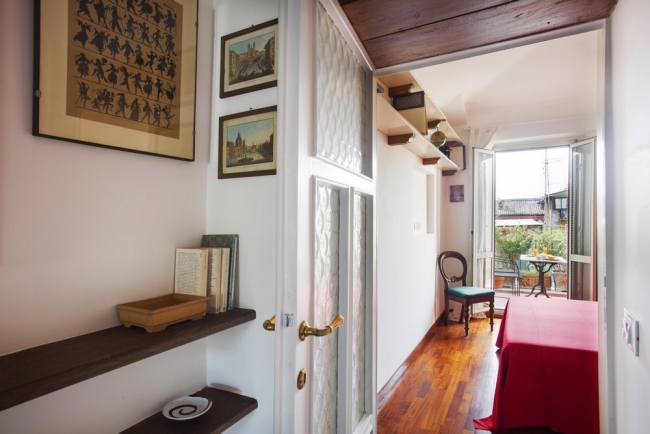 The second bedroom (8.50 m² - South facing) has also sloped ceilings and has a Velux and a French-door leading to the charming second terrace. 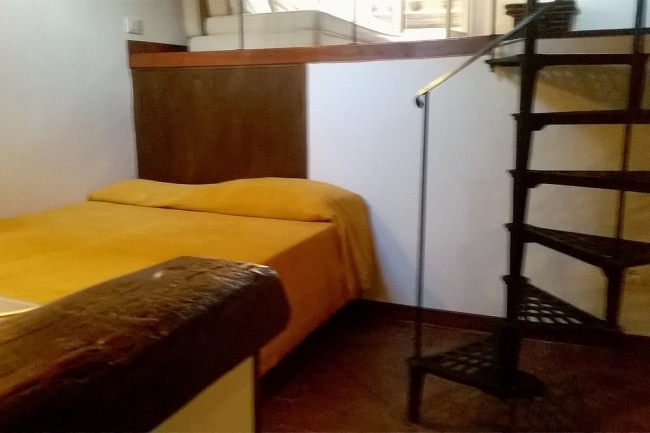 It’s furnished with a low bed for 2 people, a TV, and a library. 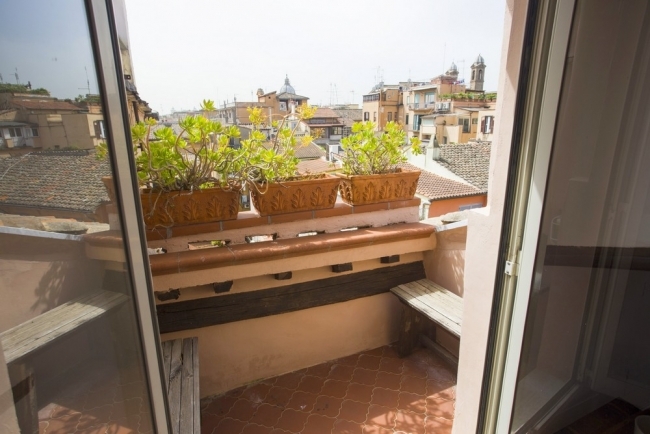 The second terrace (2 m² - South facing) offers a splendid view of the dome of St. Peter, the monument to Vittorio Emanuele II and the rooftops. It’s a real pleasure to seat on one of the 2 benches and enjoy the view. 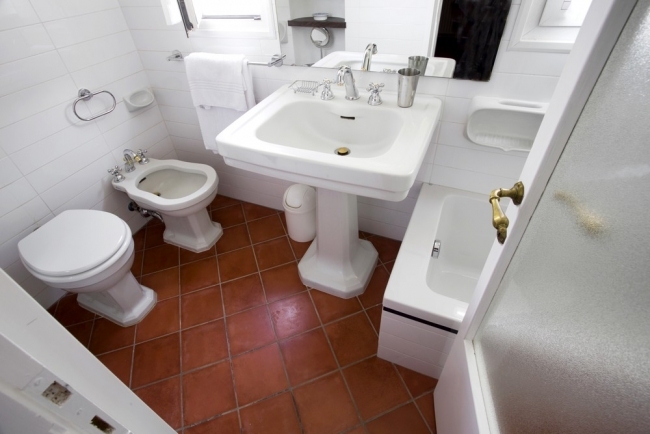 The bathroom is located on the 1st level, near the entrance and has 2 small windows. 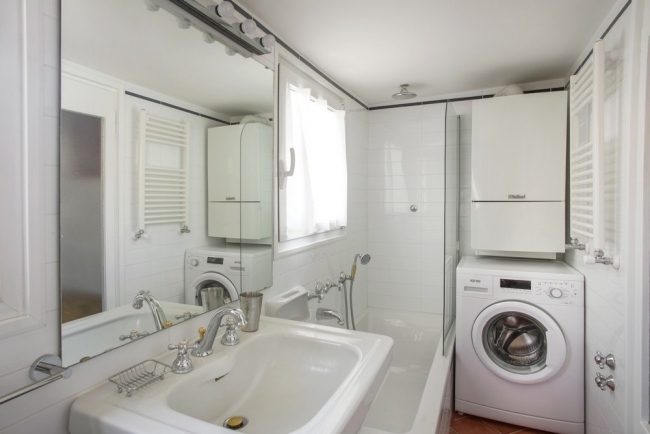 It features a bath with shower, a sink, a bidet, WC and a washing machine. 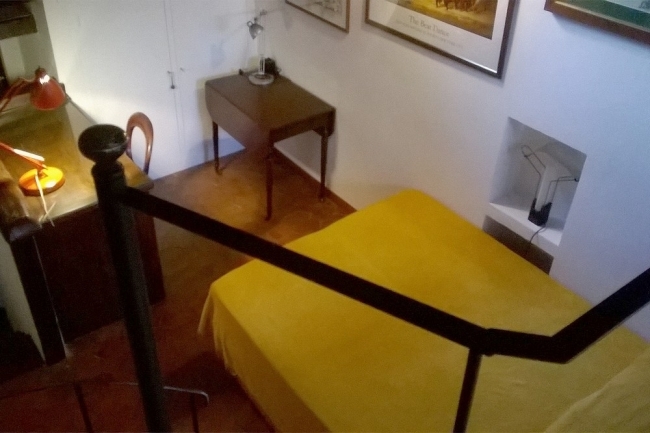 The upstairs bedroom has sloped ceilings. Very narrow access stairs to the mezzanine.